latest luxury offerings in home decor, spa, food and art. Lower Parel in Mumbai is emerging as a luxury hub with hotels, restaurants, residential apartments and high-end stores. 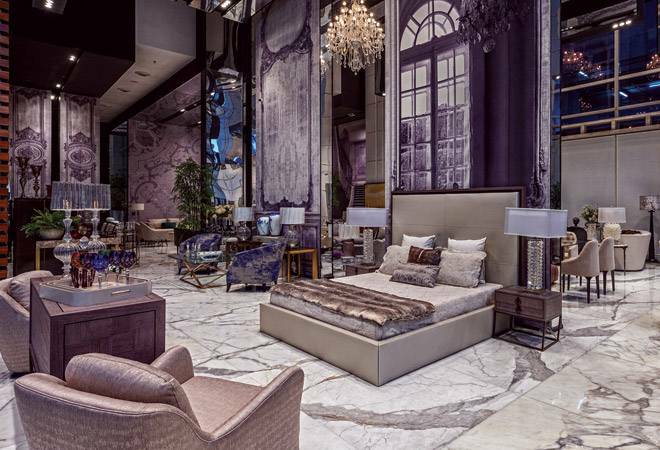 Luxury furniture brand Maison by International Furniture Brands has now opened its first flagship store in India there. Located at the iconic Indiabulls Finance centre, the store is spread across 4,000 sq. ft. and showcases an exquisitely curated collection of transitional furniture and accessories, sourced from luxury furniture manufacturers from North America and Europe. Holidays mean travel, and what's travel without the right accessories? TUMI, the leading international brand of premium travel, business and lifestyle accessories has collaborated with jewellery designer, artist and New York-native Eva Zuckerman of Eva Fehren Fine Jewelry to create an exclusive, limited-edition capsule of travel accessories. The range is innovative, effortlessly chic, and quite modern. It's finally open. The spa at The Oberoi Sukhvilas Resort & Spa, Siswan Forest Range, New Chandigarh, is a tranquil, light-filled space spread over 12,000 square feet, adjoining 8,000 acres of natural forest at the foothills of the Himalayas. It is a carefully created relaxing environment to promote a sense of well-being through Ayurvedic, Eastern and Western therapies. There are hydrotherapy pools, aromatic steam, infrared sauna and heated tepidarium. Take a power nap; participate in mindfulness activities or just day-dream at the relaxation lounge or library. Purposeful and customised authentic Ayurveda rejuvenation, detox and weight management programmes of 7, 14 or 21 days are offered to help individuals discover their inner "sukh". Guests are encouraged to spend time soaking up the healing energies of the forest through guided forest bathing, bird watching and star gazing. The reinvented Chanakya mall in central Delhi is quickly emerging as the new luxury hub, with stores of brands such as Hermes and Valentino. Add to that an iconic new restaurant with 17 different cuisines called Mkt and the capital's food choices will expand manifold. The luxury food hall will serve a range of cuisine from Vietnamese to Korean, and chicken bao to ceviche - you can first shop and then eat till you drop. Rolex has always been more than a mere watchmaking company. The Swiss company is one of the world's leading patrons of arts and science with the Rolex Awards for Enterprise as well as the Rolex Mentor and Protege Arts Initiate. Started in 2002, the latter connects mentors with bright talent across seven artistic disciplines: dance, music, theatre, film, literature, visual arts and architecture. This year, Chaitanya Tamhane, the director of Court, got to spend time with the brilliant Alfonso Cuaron (Y Tu Mama Tambien, Gravity), and the two will make a joint presentation at the Rolex Arts Weekend in Berlin on February 3 and 4, 2018. The Rolex Arts Weekend is curated by Stefan Schmidtke, the German director and dramaturge who is currently head of programmes and events at the Humboldt Forum. Among the other pairs were South African dance protegee Londiwe Khoza and her mentor, Israeli choreographer Ohad Naharin; and mentor Philip Glass who will introduce his protegee, Peruvian composer and intermedia artist Pauchi Sasaki.